How ‘green’ is the NHL? Sport is a consumptive activity. Winter sports are even more consumptive. The NHL seems to have figured this out and has taken on a myriad of green activities to off-set its environmental impact. As someone who has spent a good amount of time researching corporate social responsibility initiatives the NHL Green program makes my head spin! The NHL’s other community initiatives (e.g. Hockey is for Everyone, Hockey Fights Cancer and Let’s Move) all seem rather straight forward, but click on the NHL Green link and you are instantly bombarded with information. We’re talking counterbalancing of carbon emissions, saving fresh water, Earth Hour commitments, and filling food banks. Since sustainable development is Millennium Development Goal #7, I question if the NHL is quickly becoming a leader in this challenge or is it merely greenwashing? I will preface this discussion with the fact that I am not an environmentalist. Thus, the purpose of this post is really to highlight some of the work being done by the NHL and then you environmentalists out there can chime in as to whether these are meaningful endeavours or not. As I mentioned there are really too many NHL Green initiatives on the go to discuss them all, which sort of makes me think that they might be casting a very wide, but shallow, net; however, there are two initiatives that struck me as rather intriguing. 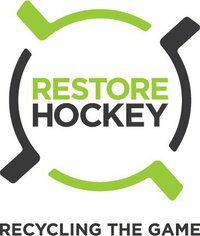 #1 Restore Hockey: The NHL has partnered with an organization called Restore Hockey, which calls itself the “Salvation Army of Hockey”. Restore Hockey collects used equipment and facilitates equipment swaps across the United States. They do not sell equipment. They collect, clean, “refurbish, sanitize, repair and restore it before donating it back to children, families and organizations who are in need.” As a registered charity, Restore Hockey also collects financial donations and will purchase starter sets of equipment for children. Seems like a pretty sensible partnership seeing as how hockey equipment definitely contributes to our landfills but the question I would like to ask is what are NHL players doing to minimize their equipment waste? Everyone can make a difference, I agree but I would argue that high performance hockey teams probably create more waste in a week than a junior house team would in a year. I would love to see research on how many broken composite sticks are thrown away every season. Elite athletes are the hardest on their equipment and therefore also have to replace their equipment more often. Every year CCM, Bauer, Warrior and everyone else comes out with a new line of equipment and the pros, whether they are actually using the new stuff or not, have to look like they are using the new equipment. What happens to all the old stuff? It’s great to make sure that a youngster who can’t afford equipment receives the opportunity to play but as long as capitalism necessitates consumption, is restoring old equipment good enough or is it window-dressing? The frozen pond is the spiritual birthplace of hockey. For years, NHL stars have learned to skate and play outdoors. The League and the NRDC are committed to preserving these natural rinks for future generations. The skating season generally isn’t starting that much later than it did 55 years ago – but it is ending earlier. In some cases, as much as 15 days earlier. The NRDC has used a very nostalgic and idealistic image of hockey, supposedly at its purest, in order to draw attention to its cause. I only wonder how much water we consume for our indoor rinks. One out of every five people in the world does not have access to clean drinking water, yet we use it to for recreation. We consume water during play. We spray it on our faces and some of us (you know who you are) spit out clean drinking water onto the ice during play. Then we use it to cleanse ourselves after we play. I find cognitive dissonance with the Gallons for Goals initiative because as much as the NHL and the NRDC tell us water is an important and vital resource (and I know that it is), we treat it with such disregard that I find the attempt a little disingenuous. I see a lot of effort coming from the NHL Foundation, NHL operations and the venues themselves but I would like to know, as I mentioned earlier, what are the NHL players doing? It seems like a lot of money is directed towards balancing the NHL’s impacts but what about addressing the source – the players and their travel. Interesting post, Courtney. I’ll start by admitting that I don’t know much about the NHL’s ‘green’ initiatives, other than what you’ve mentioned (so forgive me if they’re doing some of these things already). For my part, seeing as we’re talking about the National Hockey League, and by association the facilities it uses, I’d be interested more in talking about the resource consumption of those enormous arenas the games are played in. It takes a whole heck of a lot of energy to power those buildings and keep the ice in good condition, after all (especially by the time the mid-June Stanley Cup Finals come around). I tend to suspect that if the NHL was actually interested in ‘greening’ it’s operations in a meaningful way, they’d start with trying to look at partnerships with arena owners or sponsors for retrofits that comply with the latest standards for building efficiency (i.e. LEED). In addition, they might look at the efficacy of alternative sources of electricity, which in some jurisdictions might also allow the building to generate more power than needed and sell it back to the grid to turn a profit and help pay for other initiatives, charity work, or what have you. From my brief visit to their website, I saw that it mentioned purchasing carbon offsets to try and reduce the impact of the playoffs on the league’s carbon footprint. But: in my opinion, the carbon credit market has it’s own set of ethical problems (like having a market for buying and selling the right to pollute rather than actually reducing energy consumption or pollution production). As you said, travel and equipment waste are huge costs to the environment too, but baring a huge cut down on number of games or even fewer east-west match-ups in the regular season than we see now, I think the only thing that could reasonably be done about travel would be to purchase carbon credits for team flights, which has the same sort of problems as the NHL’s plan for offsetting its playoffs carbon footprint, and may do very little to reduce environmental damage in reality. As far as equipment waste goes, I’d love to know if any effort is made to recycle the composite sticks, or if the potential to do so even exists. Thanks for commenting. I know that MLB and the NFL have received positive attention for making their facilities more green (LEED certified) by incorporating wind power and solar panels here and there. One of the teams has also encouraged their fans to get to the game by biking. So in this respect, the NHL seems to have some catching up to do. It seems to be, as you’ve pointed out, doing more WITH their waste than actually reducing it. You also brought up a really good point about energy credits, which I didn’t feel comfortable writing about but I share your view – that it’s really a loophole and it doesn’t address the root of the issue. We will have to wait and see if and how the NHL wants to deal with the footprints of their venues. I’m sure they are well aware that venues is where most of their money poorly utilized. I assume it might prove to be the best area for cost-cutting. Good post Courtney. Hockey and environmentalism is something I’ve been curious about, but never looked into. Definitely an interesting and potentially problematic CSR area.